As promised, attached are some photos of miniature Herefords we have for sale. Zizi is a quiet girl who has a lovely dark coat. Lisa certainly likes her food as you can see. Wilbur is not related to Zizi or Lisa and together they would make a great package to start your own stud. Ronald was born in March last year so is only 10 months old so you can see how chunky he is going to be. Give Chris a call on his mobile during the work day or on 08 8380 5343 after dark as we have little mobile coverage when we are home. Our miniature Herefords have settled in well at Oakdale. We have acquired some extra cattle and are looking forward to the arrival of calves soon. It has been a relatively quiet year for Miniature Herefords in South Australia over the past year but some great things have emerged. The Paskeville Field Days, one of the largest in Australia, and attended by many thousands of people from the country and the city alike, converge on the small town of Paskeville each year for a week long display of predominantly agricultural equipment and services. This year was a great success and apart from the very warm weather, a great turnout. Ern Ackland from Weetulta, was asked if he would be prepared to form a display at the Field Days and in fact, be a part of the ‘Yellow Brick Road’ which many families enjoy. Ern was delighted and took two cows (in the trailer) and their recently born calves (in the family car) to his fabulous indoor display area. Being indoors was a great advantage in the heat and he was supplied with yards, hey etc. The cattle settled in nicely and the crowds were enthralled with the placid nature and size of his cattle. Ern also ran a competition to ‘Name the Calf’ and received many entries to name the newborn calf. The publication the Stock Journal run a front page photo of the winner and an editorial about Miniature Herefords. 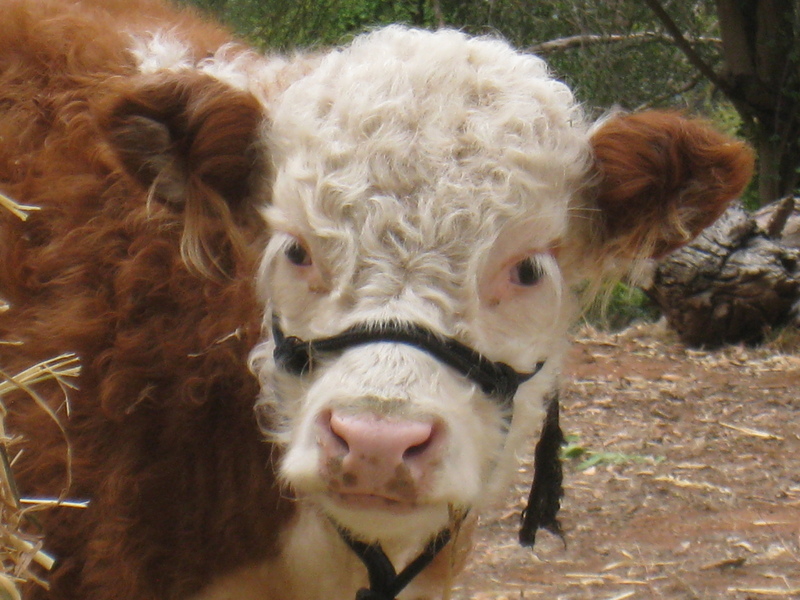 Ern also appeared with ABC Radio and spoke about Miniature Herefords. Ern’s display, the preparation he made in signs, brochures, the time he spent there, the transportation of animals etc. was a great job well done and certainly a huge promotion for Miniature Herefords. Our thanks to Ern and his family for their involvement and efforts. 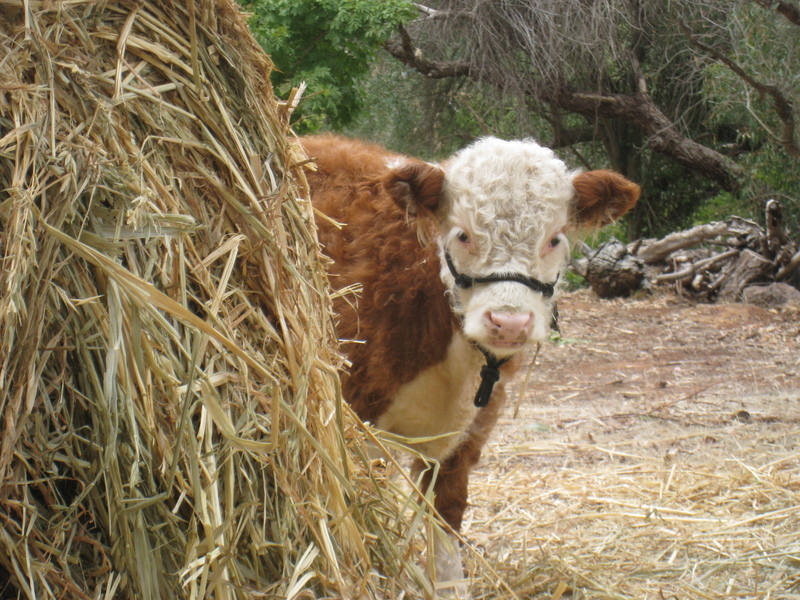 The Royal Adelaide Show also provided the opportunity for Ern to display his cattle in the Animal Nursery which of course attracts many thousands of visitors. 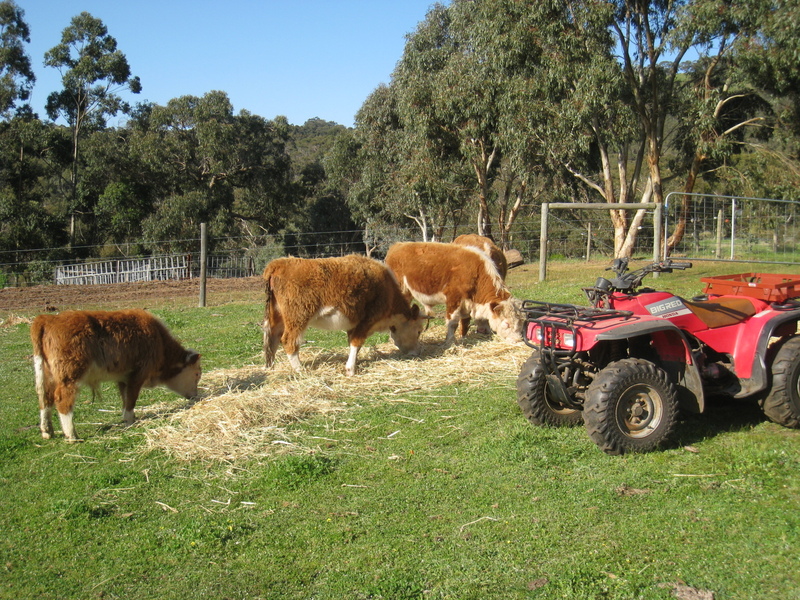 As Ern lives about 3 hours away, it is a significant effort for him and his cattle, to travel to Adelaide and his cows are well looked after whilst they are there. The other important thing that has come from this time of drought is the hardiness and the ability of Miniature Herefords to ‘do well’. As feed has been a major consideration for all owners this year, we have learnt that in our area, our cattle have done very well indeed. Our cattle that have not calved have not shown any weight or condition loss and still have their little ‘pods’ of fat either side of their tails, our bull included. This is a testament to the hardiness of these cattle in times of little ground feed. Originally from Herefordshire, England, they are found in the temperate parts of Australia. The breed also enjoys great popularity among ranchers in the desert American Southwest of the United States, as well as in the centre and east of Argentina and in Uruguay. 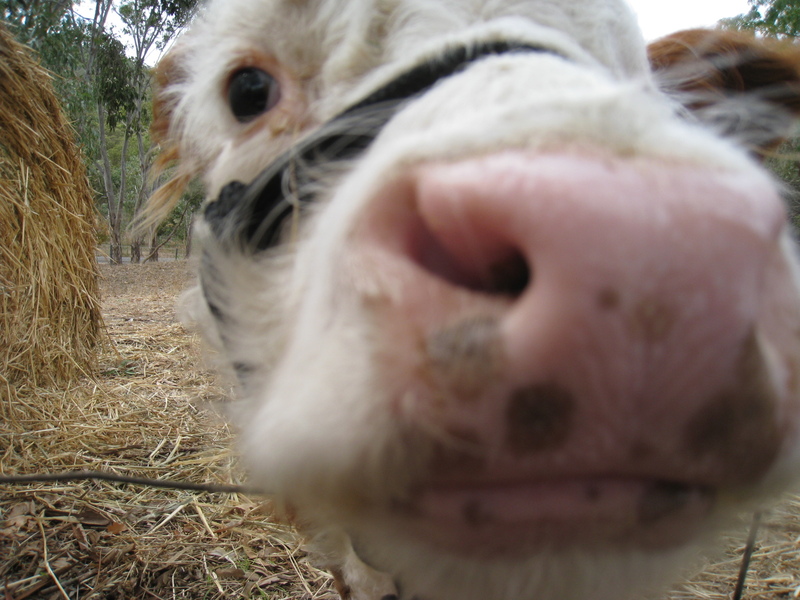 Herefords made up the largest percentage of registered cows among herders in New Zealand. This is a testament to the hardiness of the breed; while originating in cool, moist Britain, they have thrived in much harsher climates. The breed has adapted to a wide range of climates on nearly every continent. Hornless variants with the polled gene are known as the Polled Herefords. Breeding horned and hornless together functions as a genetic dehorner. This is often used as an alternative to a dehorning process, which causes stress and often weight loss. Closely related to the Miniature Hereford, the breed is known for its high-quality meat and its excellent maternal qualities. 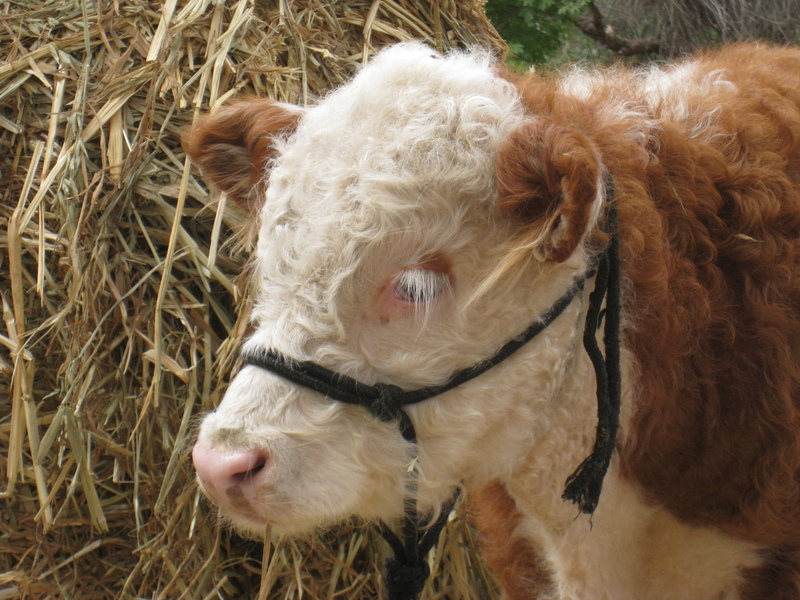 The Hereford’s temperament is more docile, allowing easier handling than other cattle breeds. Its meat quality is very good, in some strains rivaling that of Angus, another “British Breed”, known for ‘marbling’ (intramuscular fat). The World Hereford Council is based in the United Kingdom; the Secretary General, Mrs. Jan Wills, is from New Zealand. There are currently 19 member countries with 20 Hereford societies and 7 non-member countries with a total of eight societies.